The Munchkin Push-to-Close Extending Baby Safety Gate will blend in smoothly with your décor, whether you have a modern or a traditional house. It’s made from metal and dark grey in color, sleek and attractive. Whether you use it to seal off the staircase from your children or in doorways, the gate will merge effortlessly. Lightweight and sleek, you can trust this gate to strongly hold its fort and keep your toddlers and small pets out of areas in the house you consider dangerous. The Munchkin Push-to-Close gate can be used anywhere inside the house, but mostly around your staircase. The Munchkin Push-to-Close Extending Baby Safety Gate is 29 inches tall in height, high enough to stop your growing children from climbing over. The gate, in full, fits an opening from 28 inches to 45 inches wide, which is enough for regular to broad staircases, entrances and hallways. The gate is easy to install and use; it is hardware mounted so that you can be sure of it to remain sturdy even when roughly and heavily used on dangerous locations like, at the top of the stairs. It contains an unique mechanism that stops the gate from putting too much pressure on your banisters, if that’s something you are worrying about. You can open and close the gate a thousand times in a day, and it would not harm your walls or your banisters in any way. The lock is strong and complex so that an adult will be easily able to open it, but a child wouldn’t. One hand is all that you need to open the latch and swing the gate. The gate can swing open both sides, but also fixed for convenience to open from to one side when used at the bottom of the stairs. 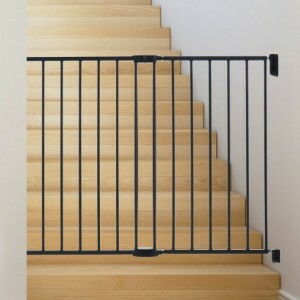 If you have a modern staircase with particularly slim banisters, it might be a problem to attach the gate using screws. 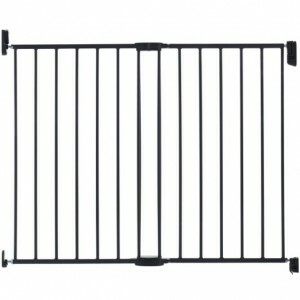 Using hardware to mount the gate might also cause some damage to the banisters, especially if they are slim or metal. Besides, installation is a two-man job, so you might need a pair of extra hands when installing the gate.